1. 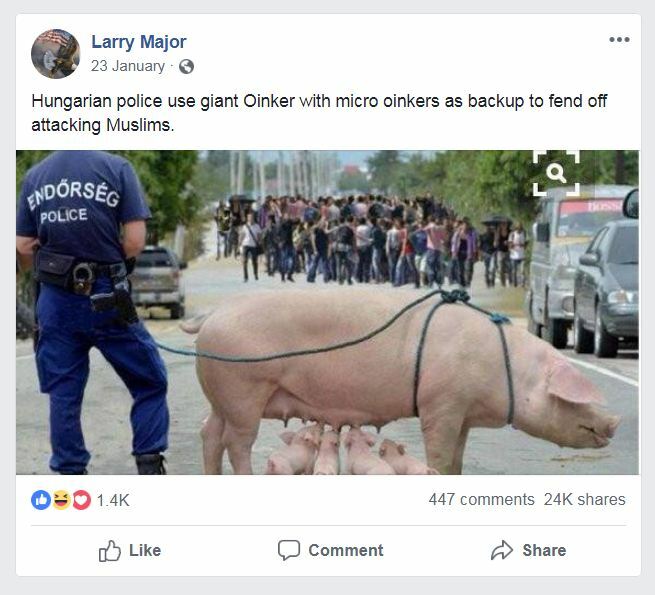 Hungarian police use giant Oinker with micro oinkers as backup to fend off attacking Muslims. 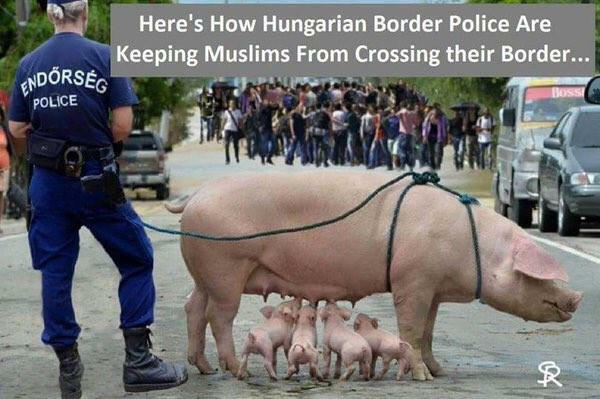 A strange story and popular picture in circulation on social media claims to show Hungarian Police Using Pigs to Keep Muslims from Crossing their Border. The picture shows a police person holding a giant Oinker with baby oinkers standing in front of what appears like a group of incoming people. The story appeared funny to many viewers and also provocative, considering the fact that Muslims abstain from pork. The claim however, about Hungarian Police Using Pigs to keep off Muslim migrants from entering their border is not true. The story in question is doing rounds online since at least 2016, on social media and image sharing websites. One Facebook post shared in late January 2019 garnered thousands of shares. Nonetheless, the picture accompanying the story is not real. Firstly, like told in the story, there are no credible reports about Hungarian Border Police using Pigs to keep off Muslims. The picture also is photoshopped one, a composite of at least three different images. The person in police uniform does indeed show Hungarian Border Police, but he is not holding or guiding the Pig. 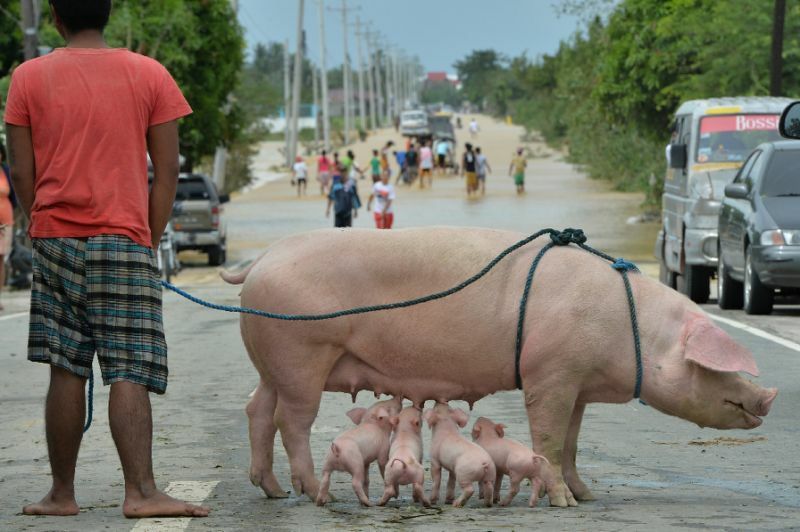 The original picture comes from October 2015, which in fact shows a Philippine resident standing with his rescued sow and suckling piglets. In far background are some other people wading through a flooded highway on the outskirts of Manila, a day after Typhoon Koppu hit Aurora province. In September 2015, Hungary government shut the main land route for migrants into the European Union to halt Europe’s influx of refugees. Earlier, the Prime Minister requested the large number of European-bound Muslim refugees not to come. Later, to stop the migrants, Hungary also erected a razor wire topped fence along its southern border. Around the time, a Hungarian member of the European Parliament mentioned on Twitter that keeping pigs’ heads along the border fence can effectively deter and keep out the migrants. It created an outcry from human rights activists. Nonetheless, no pigs were used to harass and drive away the refugees/demonstrators. Most probably, the story in question surfaced as a meme in that scenario and appeared in several related memes later.